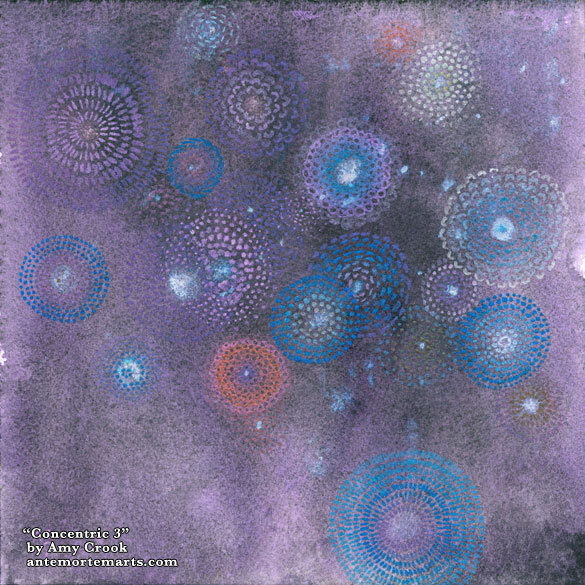 Another Concentric abstract this time, one that holds some of the meditative quality of its creation. 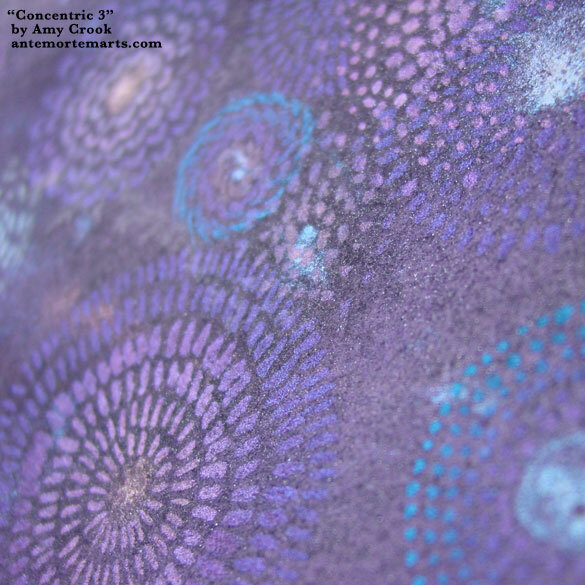 This one sparkles in every layer, from the tiny chips of amethyst in the background depths, to the mix of shimmery special effects paints used in the foreground. The final effect is like fireworks against a violet, star-speckled sky, brightening the room with their shine. Above, you can see a small section of the firework-like bursts of concentric rings. Below, the painting sits in a frame, resting before its trip to its new home. A bird of prey stoops above, but our mere human eyes can’t see what it’s diving for down in the scrub grass clinging to the hillside despite the season. 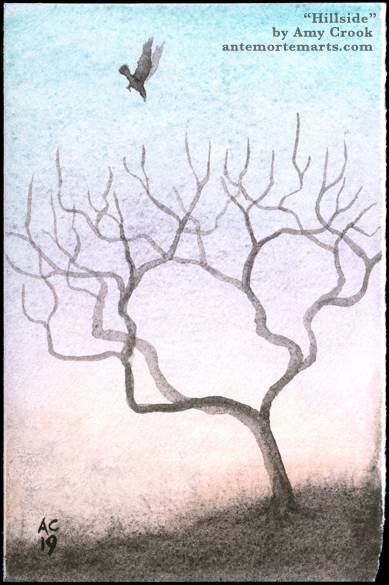 The tree is stripped of its foliage, half vanishing against the twilight, everything softened by mist and distance. 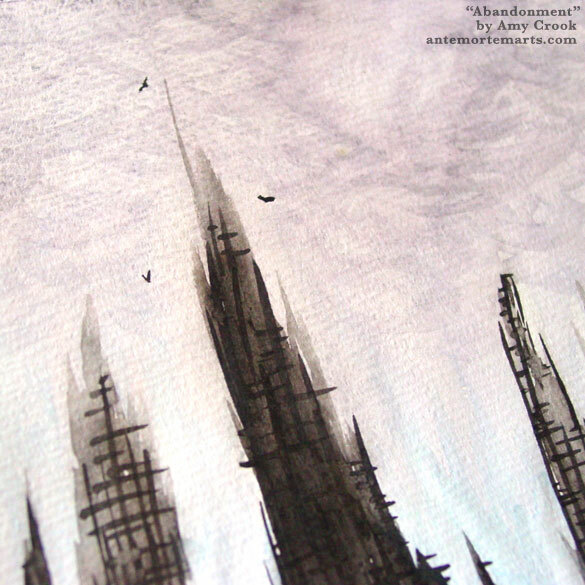 The limited palette blends beautifully, mineral paints that cling together on the soft paper. The sunshine is rust, the sky turquoise and amethyst and barely-there vivianite, creating a glow against which the bloodstone paint seems almost transcendent. There’s a missing corner on the lower right, but as you can see in the photo, a frame will easily hide the slight imperfection so only you and your artist will know it’s there. 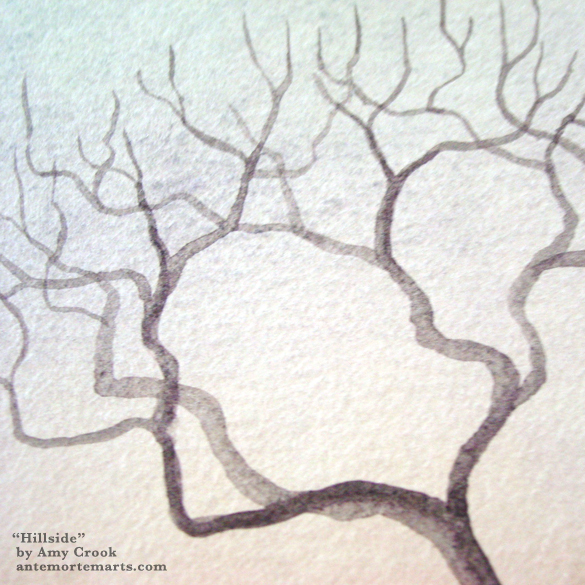 Above, you can see the twining branches of the tree vanishing into the mists. 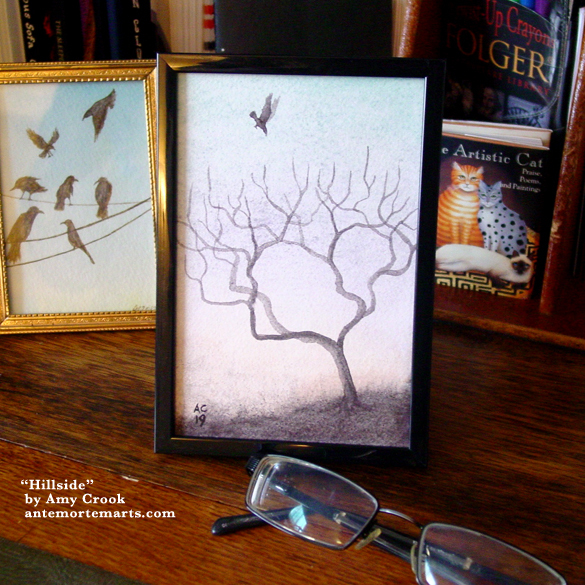 Below, this small painting rests in its frame, the perfect size to tuck a bit of mystery into your life. 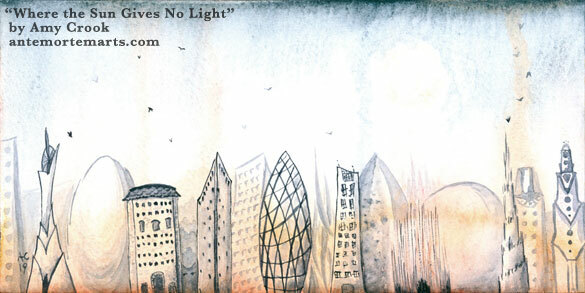 Despite the bleak (and vaguely naughty) title, this painting is full of light and hope. 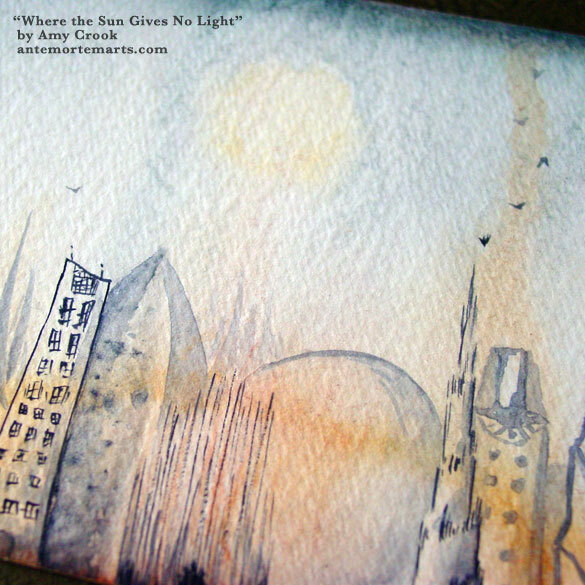 The sun is a dim orb above the city but its light casts no shadows, which are instead from something off the page entirely. There’s soft glasslike round buildings, strange towers, completely normal skyscrapers, and of course a sneaky cat. Whimsy and wonder in one alien city, silhouetted against a glow that has no source but still illuminates better than the wan sunlight. 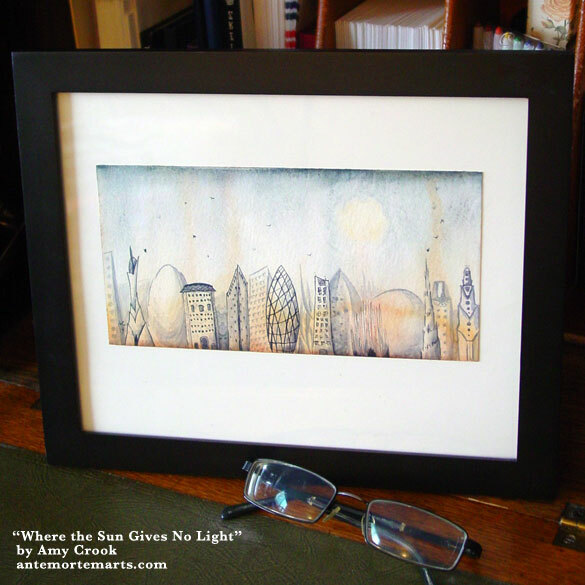 Above, you can see the warm stripe of light reflecting off the distant skyline. 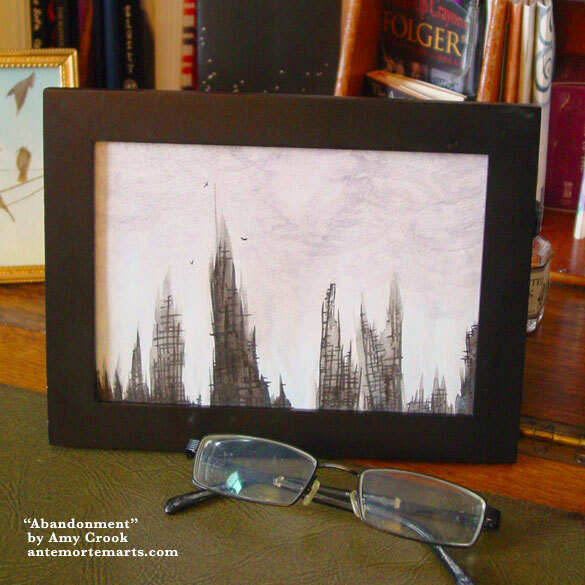 Below, the city waits in a temporary frame, trying to find its forever world. 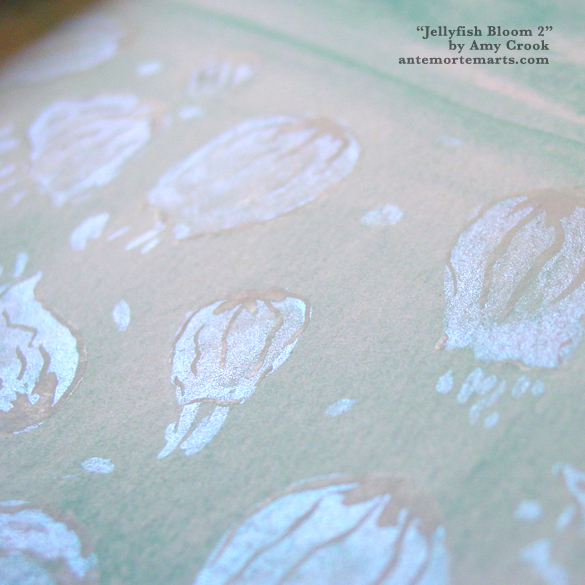 The jellyfish are blooming again! Near-transparent against the turquoise sea, they float below and only catch the light when it suits them. Their bodies are made of a shimmering interference blue that nearly vanishes, while the opaque white ink of the ribs and details keeps them visible even when the sunshine is fleeting. 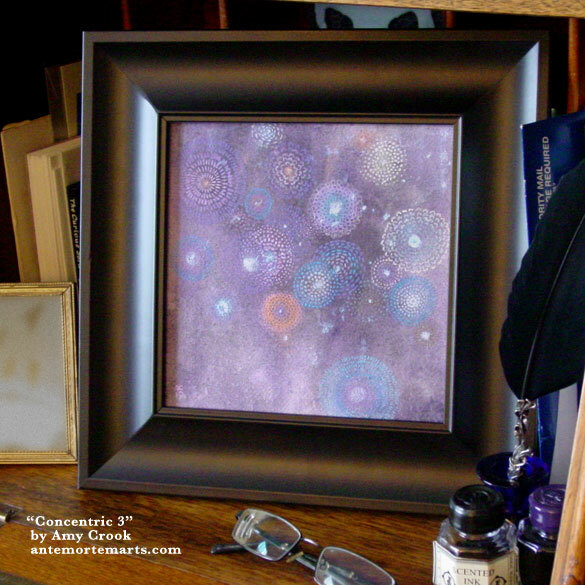 This painting is beautiful in person, a tiny box of jewels to adorn your life in pale blues and enameled whites. 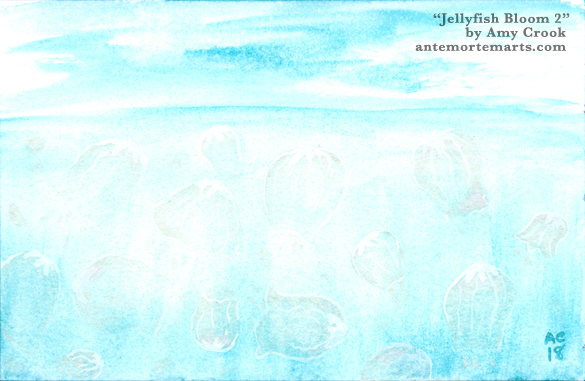 Above, you can see the sun glinting off the near-invisible shine of the jellyfish, turning the matte white ink into shadow. 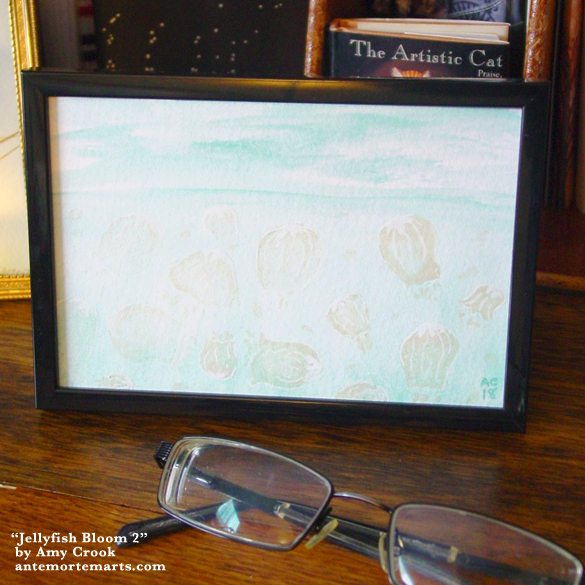 Below, you can see these tiny jellies in their own frame, like a tank of lovely pets that never need to be fed. Often the skies come first and then the foreground goes in to match, but this time the ruins grew up out of the ashes of avoidance, and the purple clouds came rolling in later. 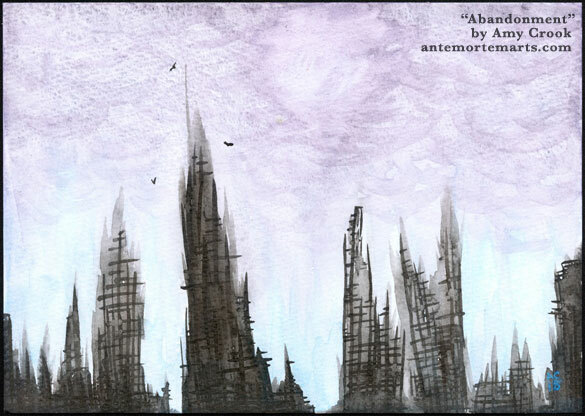 Spiky, burnt-out buildings lean into one another, smudged with smoke and abandoned by everyone but the carrion birds. More ruins for a world on fire, but hey, at least they’re pretty. Above, you can see the most-intact tower and its circle of carrion birds up close and personal. Below, the bleak landscape sits in a frame, like a window to a ruined world. 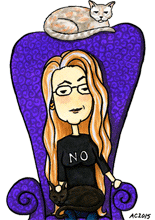 ‘Striking out’ is a phrase with many connotations, from violence to adventure to failure. 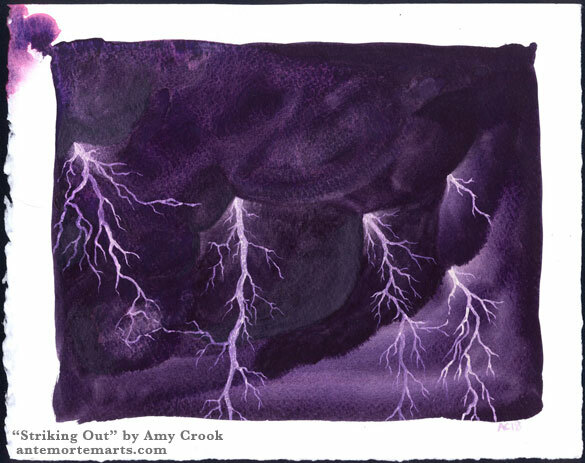 It seemed fitting for this brooding violet storm with its lightning that lands three times and flashes twice more, the paint translucent white from one angle and vibrantly purple in the light. Even the clouds hold some secret sparkle in their depths, the promise of rain or perhaps a portent of yet more sparks waiting to emerge. 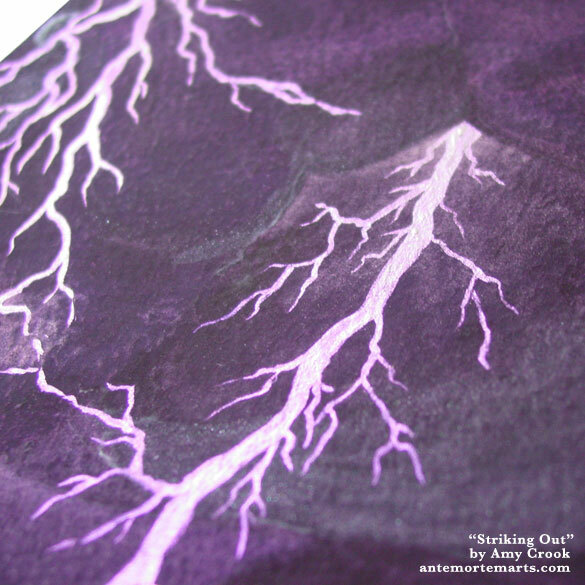 Above, sunshine limns the lightning in shimmering purple. 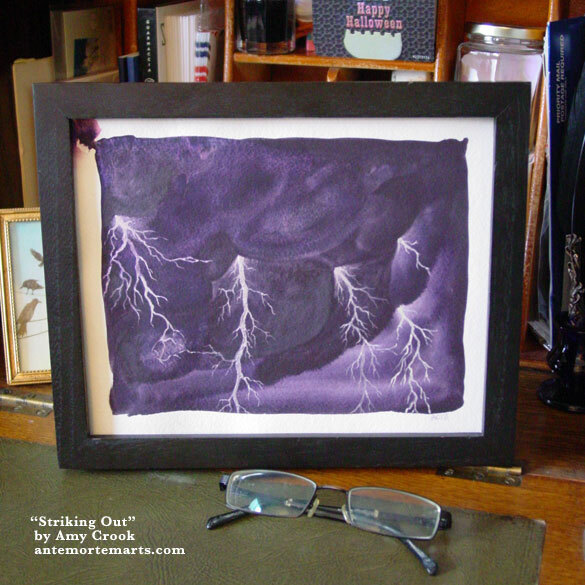 Below, the storm is safely contained in a frame, waiting to strike out for its new home. 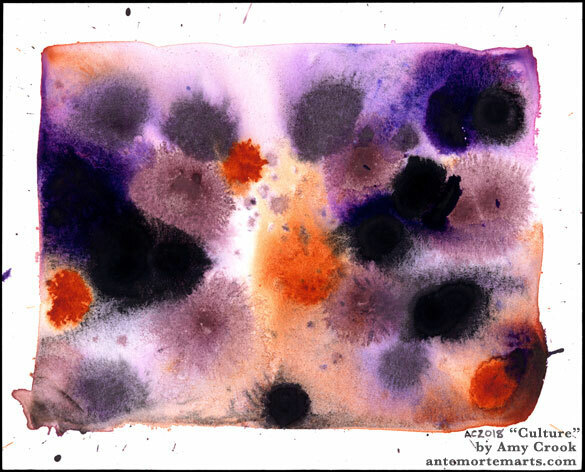 Bold splashes of burnt orange spark through a field of purples, from a soft mineral lavender to a deep violet black. A loose, liquid boundary almost contains the color like a frame, but there’s splashes all around, joyfully bursting free of the confines of geometry. 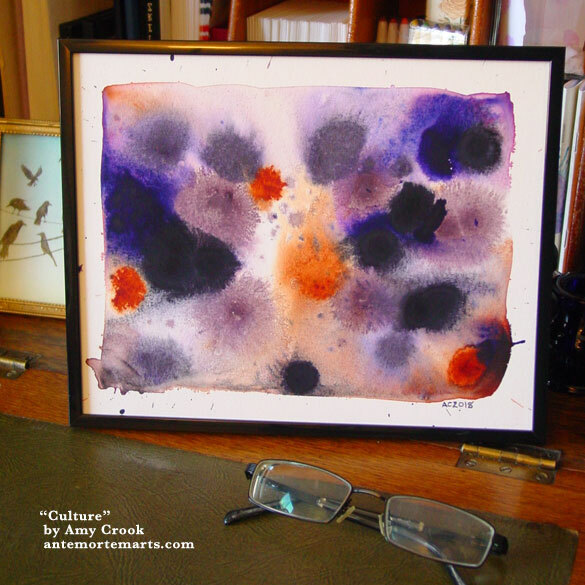 This is a gorgeous abstract, bright and warm without being too obnoxious, and would go elegantly in any room. 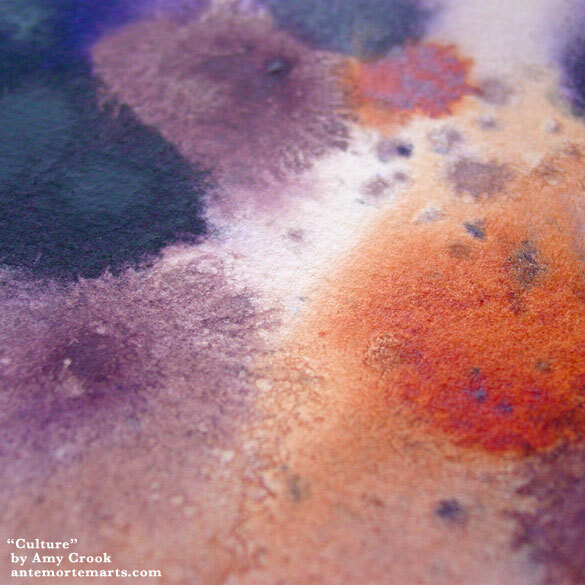 Above, you can see the delicate lace formed as the colors mix and blend, rust to peach, purple to paper white. Below, the culture waits behind glass to be examined, appreciated, and enjoyed.